Background: Major ocular trauma is an injury with potential blindness in ophthalmology. The aim of this study was to evaluate the demographic and etiologic factors of major ocular trauma in a tertiary hospital in Northern Taiwan. 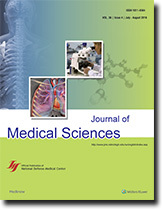 Subjects and Methods: A retrospective review of patients who suffered from open globe injuries and underwent management in a tertiary hospital between January 1, 2005, and December 31, 2014, was conducted. Patients with prior ocular trauma, preexisting ocular conditions affecting the visual acuity (VA) and those with a history of previous intraocular or refractive surgery was excluded from this study. Results: Totally 199 eyes of 195 patients were enrolled in this study. 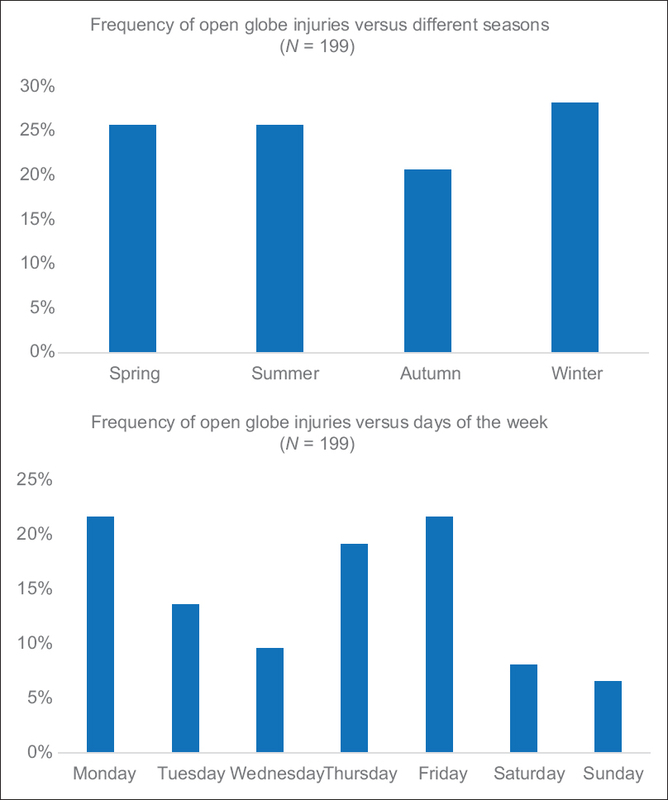 Open globe injury occurred more frequently in males than in females (136 vs. 63 patients, P < 0.0001). Workplace is the most common place of injury (56.3%), followed by home (23.1%). Among patients younger than 18-year-old, domestic-related injury was the predominant cause (78.6%), while among those aged above 18 years, occupational injuries were the most common cause (62.0%). Compared with VA measured on admission, final VA was improved in 38.6%, unchanged in 48%, and worse in 13.4%. The visual outcome was found to be significantly associated with the initial VA, posterior extent injury, length of wound, and presence of vitreous prolapse. Conclusions: Unfavorable prognostic factors for final visual outcome in these patients are related to initial VA, posterior extent injury, length of wound, and presence of vitreous prolapse. Results of this study help predict visual outcomes of open globe-injured patients in emergent counseling. Background: Chitosan, a polymeric carbohydrate derived from the exoskeleton of arthropod, has been suggested to be an excellent biomaterial for improving wound healing, especially for bones. To improve the periodontal cell attachment and growth, the cell adhesive peptide glycine-arginine-glycine-aspartic acid (Gly-Arg-Gly-Asp, GRGD) grafted chitosan membrane was introduced in this study. Materials and Methods: Two types of commercial chitosan, three types of primary cultured cells, and two established cell lines were used. Human gingival and periodontal fibroblasts (hGF and hPDL), human root derived cell (hRDC), and rat calvaria bone cell (rCalB) were cultured on the GRGD-fixed by ultraviolet light photochemical method on the chitosan membrane. With (3-[4,5-dimethylthiazol-2-yl]-5-[3-carboxymethoxyphenyl]-2-[4-sulfophenyl]-2H-tetrazolium) assay and propidium iodine (PI) staining, the cell adhesion and growth on GRGD-grafted chitosan were examined. Basal mRNA expressions of the receptors for GRGD, integrin αv (ITG αv) and ITG β3, in the human gingival fibroblast cell line and mouse osteoblast cell line (MC3T3-E1) were examined with real-time polymerase chain reaction. Results: Because the cell adhesion/growth patterns on two chitosan membranes were similar, the GRGD modification was performed on one membrane (Primex) only. For periodontal cells (hGFs, hPDLs, and hRDCs), the number of attached cells were increased on the membrane with the high concentration of GRGD than those on the membrane unmodified or modified with low concentration GRGD. For rCalBs cells, a different pattern was noted: GRGD modification did not enhance the calvaria cells attachment or growth. Moreover, mRNA expressions of ITG αv and β3 in AG09319 cells were significantly higher than those in MC3T3-E1 cells. Conclusions: With the limitation of this study, we suggested that GRGD-modified chitosan, especially at high concentration, could enhance the growth of various periodontal fibroblasts, but did not change those of osteoblasts. 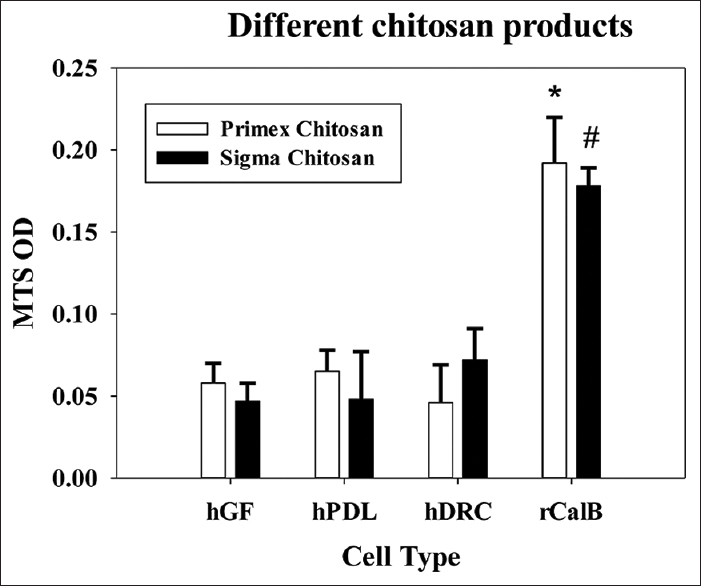 Therefore, chitosan might be an excellent biomaterial for periodontal use. Objective: The use of nanoparticles (NPs) in cancer diagnosis and treatment is a rapidly developing area of nanotechnology. The main objective of this research work is to synthesize copper oxide (CuO) NPs and to investigate its vitro anticancer and antibacterial property. Methods: The CuO NPs were synthesized via a facile and cost-effective precipitation method using cupric acetate (monohydrate) (CuAc 2 .2H 2 O), sodium hydroxide, and glacial acetic acid. By varying the pH of the precursor solution, the morphology, particle size, and reaction rate of the NPs could be well tailored. 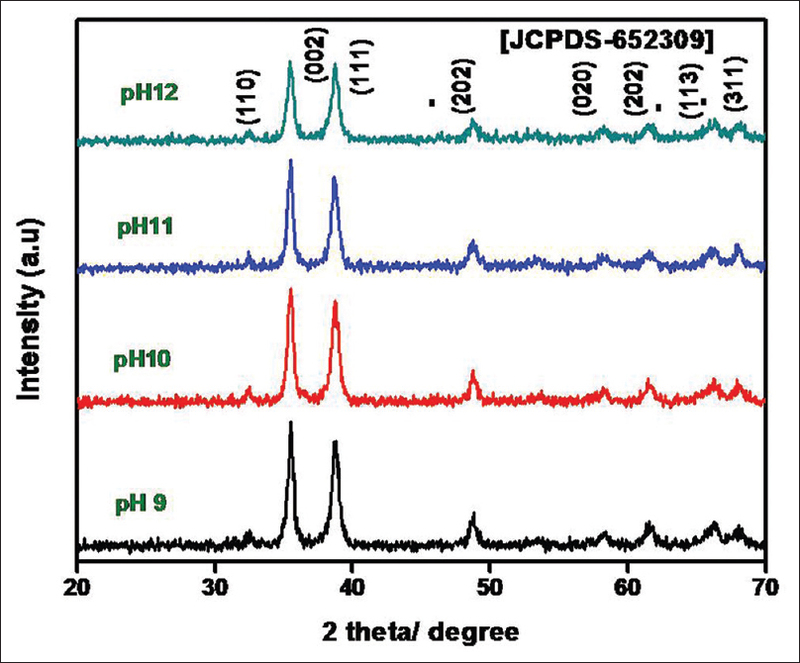 The prepared CuO NPs were characterized by X-ray diffraction, ultraviolet-visible spectroscopy, Fourier transform infrared analysis, and scanning electron microscopy. Results: The results revealed a well crystalline structure with leaf-like morphology. By controlling the pH of the solution, particle size and morphology of the NPs are altered. The synthesized CuO NPs have been screened for its antibacterial potency against Gram-positive (Methicillin-resistant Staphylococcus aureus and Bacillus subtilis) and Gram-negative (Salmonella Paratyphi, Klebsiella pneumonia, and Enterobacter aerogenes) bacterial strains. The as-synthesized NPs were found to be remarkable in inhibiting pathogenic bacteria. The anticancer activity reveals the dose-dependent influence of CuO NPs against human breast cancer cell line Michigan Cancer Foundation-7 (MCF-7). Conclusions: The results suggested that CuO NPs have a wide range of antibacterial applications which can be used to control the spread and infection of a variety of bacterial strains. The CuO NPs showed promising anticancer activity against human breast cancer cell line (MCF-7). Overall, CuO NPs are an effective candidate for pharmaceutical, biomedical, and environmental applications. Background: Past studies have observed rises in intracranial pressure (ICP) during hemodialysis (HD) in the neurosurgical patient. This phenomenon may cause secondary brain injury and further compromise the patients' recovery. While continuous renal replacement modalities can theoretically be more beneficial for the brain-injured patient, this option is often not available due to limited resources. Modified prescriptions of intermittent HD may be the more easily accessible method. The purpose of this study is to clarify whether a less aggressive HD regimen in patients with severe traumatic brain injury (TBI) will prevent ICP fluctuation during HD. Patients and Methods: We present a single center experience with the enrollment of nine uremic patients with severe TBI who underwent decompressive surgery with ICP monitoring via external ventricular drain (EVD) between January 2003 and December 2006. These patients were divided into two groups based on different HD methods. 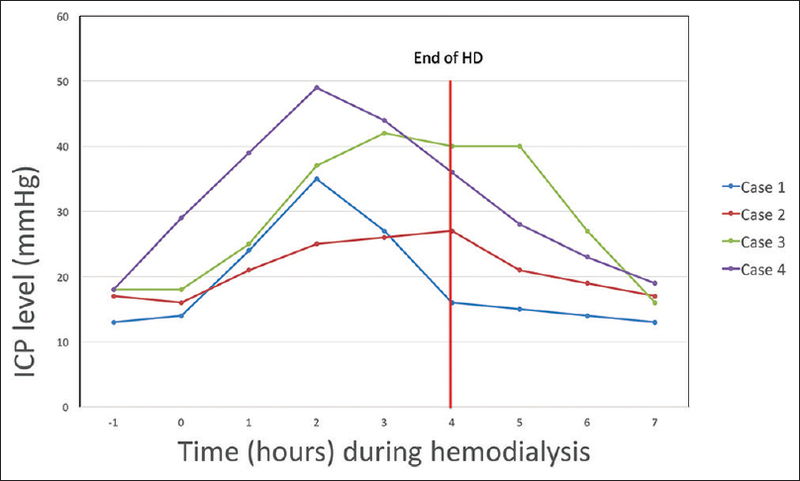 In Group A, four patients received standard intermittent HD every other day, and in Group B, five patients received a modified, daily dialysis procedure that cut the amount of fluid removed per session and the dialysate flow rate by half. Results: All patients in both groups experienced an increased ICP during HD, but milder ICP changes were found in all five patients (P < 0.05) who had received the modified procedure (Group B). All patients in Group A had expired, but there were only two mortalities in Group B. Conclusion: ICP fluctuation may be minimalized by altering the HD protocol. A less aggressive HD procedure is recommended for uremic patients with severe TBI. Meningiomas are the most common non-glial intracranial tumor with an incidence of 2.3-5.5/100,000 people, accounting for 20-30% of all primary adult brain tumor diagnoses. Meningiomas associated with hemorrhage are rare; the reported incidence is 0.5-2.4%. We share a case experience of meningioma with purely intratumoral hemorrhage. The initial image study of the intratumoral hemorrhage mimicked intracerebral hemorrhage. A 63-year-old woman with initial presentation of headache, dizziness, nausea, and vomiting has brought to the emergent department. The brain computed tomography showed a 5.3 cm hyperdense lesion over the left occipitotemporal area. Under the impression of intracerebral hemorrhage with unknown etiology, the brain magnetic resonance imaging was done for tumor survey and showed lobulated enhanced mass over left T-O area. Tumor with bleeding with skull bone invasion was first considered. The surgical pathology revealed atypical meningioma with focal clear cell change (World Health Organization Grade II), which is separated with the brain by pia meter. Meningiomas associated with hemorrhage are rare; the reported incidence is 0.5-2.4%. The clinical features about increasing bleeding tendency: (i) age >70 years old or <30 years old; (ii) the location of meningiomas locate at intraventricle or convexity; (iii) histopathalogical type: Meningotheliomatous, malignant, fibrous, and angioblastic type. Most reported intracranial hemorrhages associated with meningiomas are found in the subarachnoid and subdural spaces. There are several hypotheses for the possible mechanism of tumoral bleeding. The tumoral bleeding in meningioma is a rare event. The incidence depended on the location and the histopathological finding. There might be other indicators but still need more research. This work describes a rare case of serous carcinoma coexistence with atypical polypoid adenomyoma (APA). 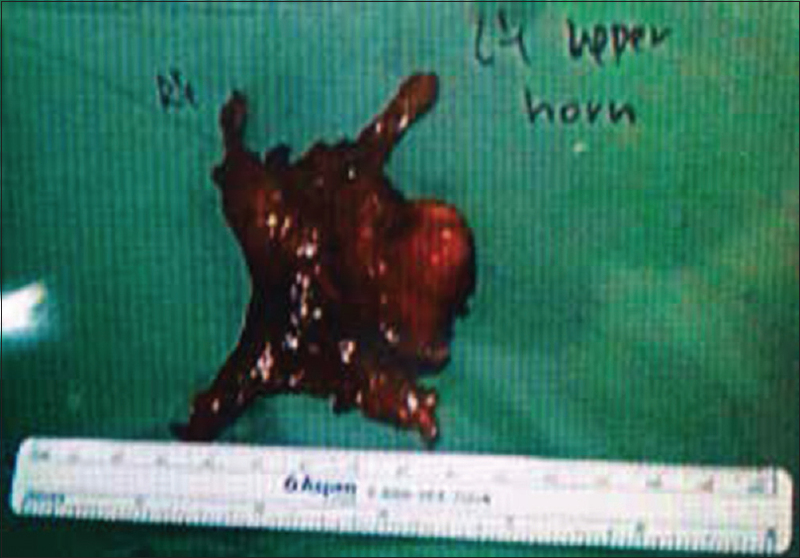 A 55-year-old postmenopausal woman presented with intermittent vaginal bleeding for 1 year. Her Pap test exhibited atypical glandular cell and endometrial biopsy showed serous carcinoma. She underwent a staging surgery, and the histopathology revealed serous carcinoma with p53 mutation and coexistence with APA staged as FIGO Stage Ia, Grade 1. The patient recovered well postoperatively. APA lesion is generally benign, but it may progress in rare cases to adenocarcinoma, usually endometrioid type. This is the first case report regarding serous carcinoma coexistence with APA. Therefore, the patient with APA should always be closely followed up. Nevertheless, further study is stipulated to better understand the clinicopathological features of serous adenocarcinoma coexisting with APA. 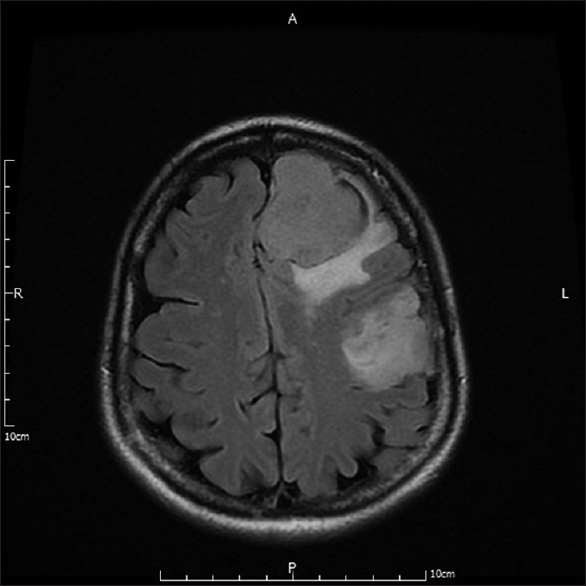 We report a case of a patient with Othello syndrome caused by two left hemispheric tumors. This 50-year-old female had experienced seizures for 10 years and developed manic-like symptoms, delusions of jealousy, persecution and being watched, auditory hallucinations, irritable mood, and violent and disorganized behavior for the past 3 years. Brain imaging studies revealed two left frontal tumors, the larger of which was causing a mass effect. The delusions of jealousy in Othello syndrome resolved after removing the larger tumor, and the other psychiatric symptoms improved after treatment with psychotropic medications. This report aims to raise awareness of Othello syndrome related to disruptions in cortico-subcortical connections in the left orbitofrontal region. Timely surgical treatment may prevent associated psychiatric comorbidities and increase the likelihood of a good outcome. Myasthenia gravis (MG) is a disease affecting the acetylcholine receptor in the neuromuscular junction. Symptoms of MG are muscle weakness and fatigue. Video-assisted thoracoscopic extended thymectomy (VATS-ET) is well established in the treatment of MG if medical treatment is failed. In the recent decade, VATS under nonintubated anesthesia has been intensively researched and reported, which has been advocated to be a preferred alternative to the conventional intubated anesthesia for pulmonary nodules. However, cases with MG receiving nonintubated VATS-ET have rarely been reported. Here, we described a successful anesthesia of a 44-year-old woman with MG undergoing nonintubated VATS-ET.